Very nice feel to this image! Nice to hear from you Brett! Was this a church? Why do abandoned buildings feel so melancholy? Is it because they appear unloved and cared for? Loss of a once-happy dream? Is that simply my perspective, while others may see something else? As always, your photos stir the mind and heart! I love your curiosity, Eliza (I’m suddenly reminded that my great grandmother was named Eliza. My middle name, Elizabeth, is in honor of her). 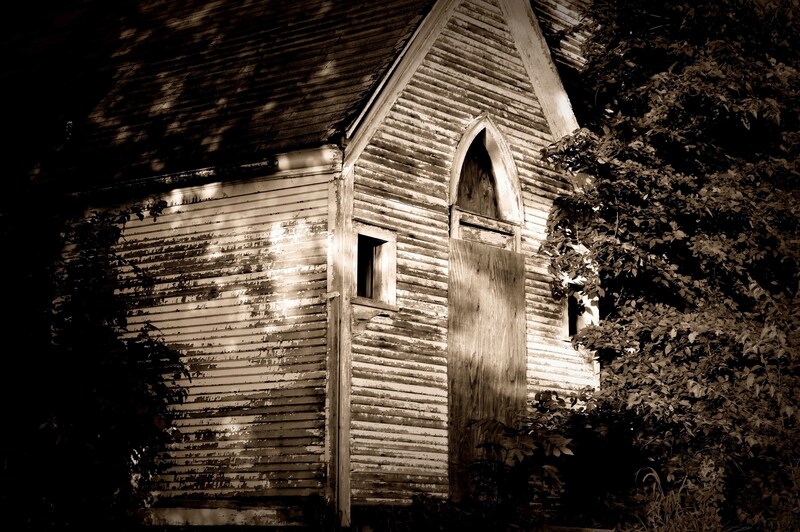 Yes, it is an abandoned church in a small village about ten miles out in the country. I recently drove through the village instead of around it and saw this building near some houses and railroad tracks. Those are great questions, and your answers, true as anything. For me, these dilapidated buildings evoke impermanence. When I see a falling-down barn or crumbling, depression-era bank, I am reminded of the fact that we’re all only here for a short time. What once was vital, strong, and full of life, will give way to the elements sooner or later. This is true of everything – plants, humans, barns and churches, even the great cathedrals of Europe. Nothing lasts forever. I am then reminded that every day is a gift and should be cherished and lived as such. I love old buildings. What a great, sad, photo. Hi Carol :). I love them, too. Sad, yes. I appreciate your sensitive view. Hello Ajay, thank you for your visits and very kind comments. I will give your new blog a good look today. Thanks very much for the follow, too.